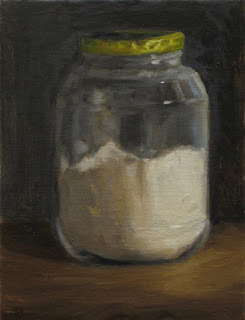 The delicate transparence of the jar with its tiny luminous details and search for dimension within the canvas were my goal in this painting also I haven’t seen flour in a painting before so I decided to do it, painted in alla prima style in daylight. One Response to "Flour Jar – still life art painting a day by artist"
Dan…I like the quality of quiet light in this painting. You can feel the peace of the day in it.